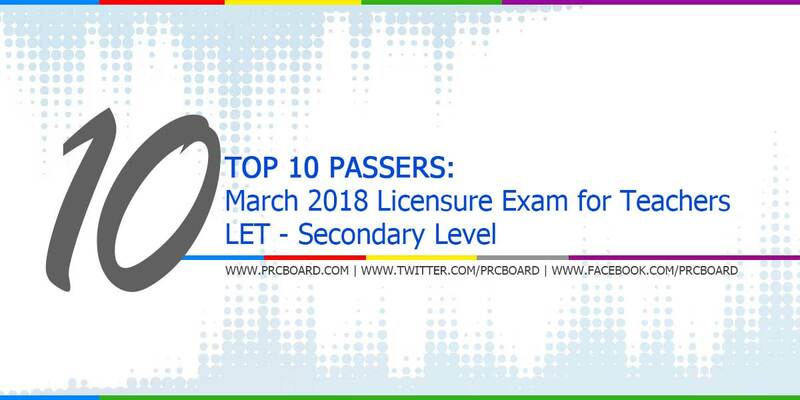 The March 2018 Licensure Exam for Teachers (LET) board exam, conducted by PRC’s Board of Professional Teachers are released 40 working days after the last day of board examination. Aside from the official list of passers, top 10 examinees, top performing schools and performance of schools are also posted. Below is the complete list of LET (Secondary Level) top 10 examinees, courtesy of PRC. While most examinees are asking about the possible release date, as mentioned in the main page of this article, it will be out by May 22, 2018 (Tuesday). To God be the Glory and Honor! Lord,I had entrusted everything to you! Let your will be done!!! The Lord gives according to His will. God bless everyone! anong oras po ang result? IN GOD'S WILL I PASSED THE EXAM. Lord, please po sana pumasa na yong ate ko. Amen. Please Lord,help my boyfriend pass tha exam also to my friends..God is good all the time! congrats to all the new teachers!!! dapat ako din maipasa ko un LET ko sa sept. i will trust to the lord in jesus christ. May result na! ! ! ? Madadagdagan na naman tayong mga LPT's. COngrats in advance. Lord kayo na po bahala sa amin hindi lang po sa akin kundi sa ibang labis ang pag-asa na papasa kami. kayo po masusunod sa takbo ng buhay namin. Ang tagal nman, sana lhat mkapasa kamag anak at mga kaibigan ko..
saan po mahahap ang result? bat til now walapading results? Maam Rhea Tadle congrats. Certified LPT na. Libre na yan! Sir Clent Balaba, Congrats! Deserve ang Top 1. I announce na raw maya-maya. Party na ito. Sana papasa ako sa LICENSURE EXAMINATION FOR TEACHERS this month of May. Lord I trust with all my heart and You always behind me forever and ever.May God Bless to us future teachers.To GOd be the Glory. In Jesus name. Amen. CONGRATS UNIVERSITY OF SOUTHEASTERN PHILIPPINES!